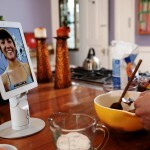 Kubi, meaning literally “neck” in Japanese, is the next big thing in telepresence. This attractively styled robotic stand from Revolve Robotics for camera-enabled tablets fits as nicely on a table at holiday dinners as it does at board meetings or in classrooms. And it represents: YOU. You control Kubi from afar, using web-based remote control and Facetime, Skype or other video calling or telepresence apps, tilting the stand up when you want to look up when family members stand for a toast and down when you want to see what’s on someone’s plate. You can take a virtual look around the room as much as 300 degrees. And if you’re bored, you can even “look” at the clock on the wall…remotely. It’s all in your hands as you control the Kubi stand from anywhere in the world. And that’s what makes Kubi so natural. The viewer is in charge of moving the tablet and camera. We’ve all been there when someone has held a tablet up for us, forcing us to see them swing the tablet from their pet dog, up to someone’s face, down again to see the baby crawling on the floor. It’s enough to get seasick. But Kubi is different, natural and get this, affordable. Delivery is expected April 2013 and Revolve Robotics is raising money now on indiegogo. Order now and you can get one for as little as $199. They’ll be $249 retail. Want to give one for Christmas? Revolve Robotics will complement your $275 order with a laser-engraved token placeholder.